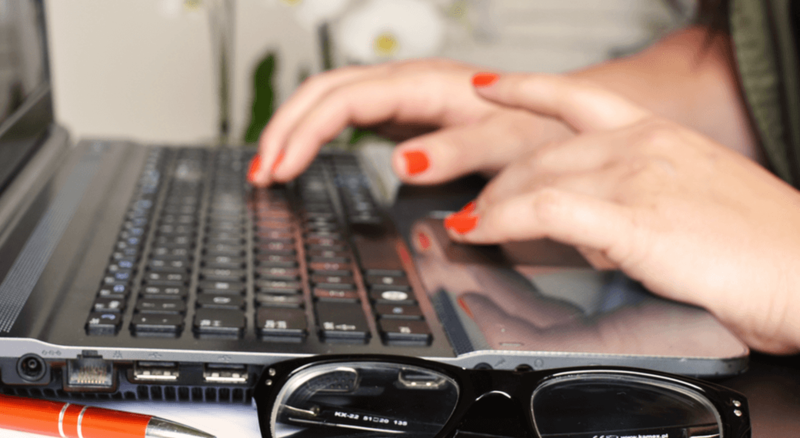 You’ve got tasks you hate in your business. I know I do. In fact, I’d love to never have to create my social media content calendar again. I’m crossing my fingers that this summer this task will be off my plate. You are probably like me and daydream about delegating all the tasks you don’t love. Dreaming of when you only focus on the stuff you are good at because you have a team with complementary skills. 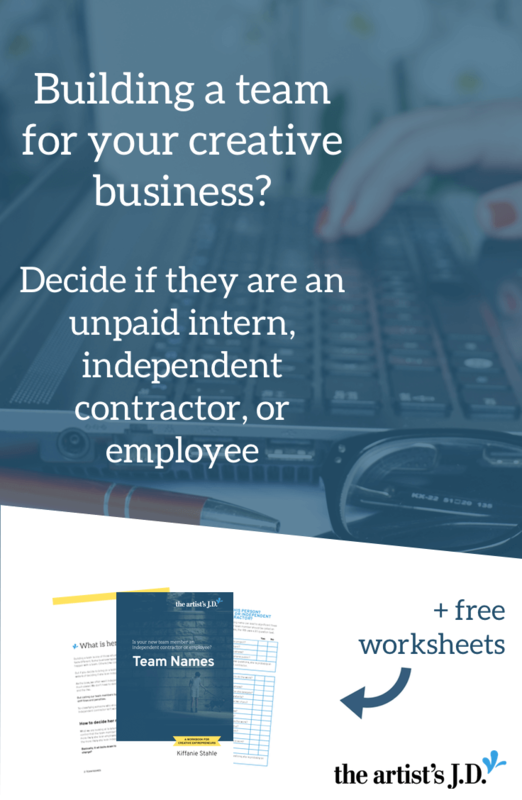 When you think about hiring help for your creative business, you might think about adding a team member as an employee, independent contractor, or bringing on an unpaid intern. Each of these comes with their own set of risks and benefits. But putting someone in the wrong bucket can lead to stiff fines and penalties. You have plenty of things to worry about. And you don’t need to fret every night about getting caught by the IRS. Who is in charge, you or them? Do you have the right to control how and when the team member performs her job? The more that you are in charge, the more likely she is an employee. 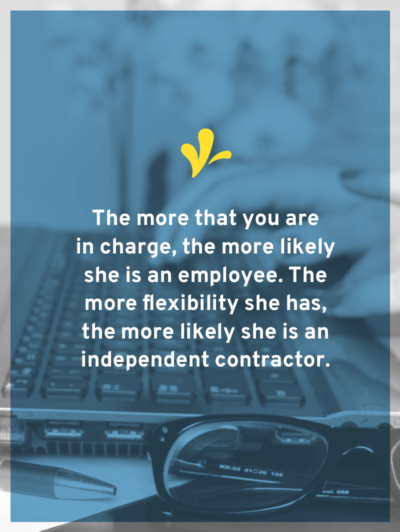 The more flexibility she has, the more likely she is an independent contractor. 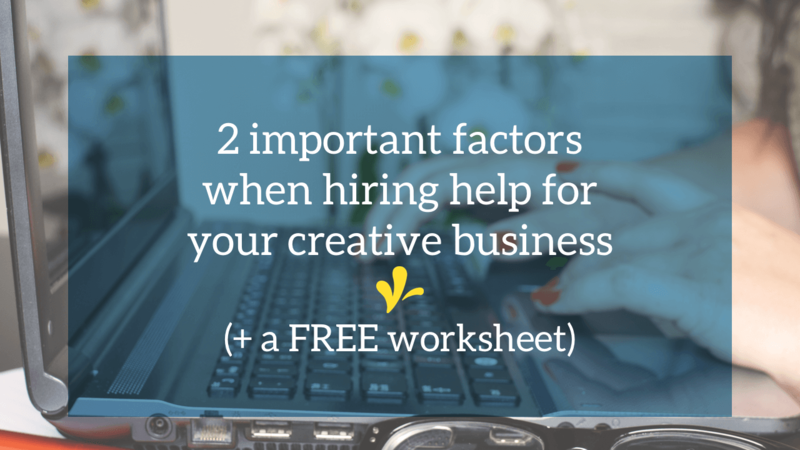 Your first step when hiring help for your business is to brainstorm. You’ll imagine what your team member will be doing. The what, how, when, and where she’ll be doing her job. Once you’ve done that, you can grab a copy of the checklist below to figure out what bucket she falls into. I’ll never have an unpaid intern in my business. I’m okay with taking calculated business risks, but this isn’t one of those risks I’ll take. And that’s because I understand the likelihood of it being legal is slim to none. Most U.S. businesses are regulated by the Fair Labor Standards Act (FLSA). (If you want to find out if you are an oddity and your employees are not regulated under this Act, you can use this tool.) The FLSA says that you must pay minimum wage to your employees. Just like getting caught for misclassifying what name you give your team members, this one is a doozy too. So it’s just not worth the risk. You’ll sleep better at night knowing that you don’t have a huge liability hanging over your head. Building a team is an exciting milestone in your business. But it’s also an area fraught with pitfalls. And an important time to make sure you stay on the right side of the law means so you don’t put all your hard work at risk. Your best way to reduce risk when hiring help? 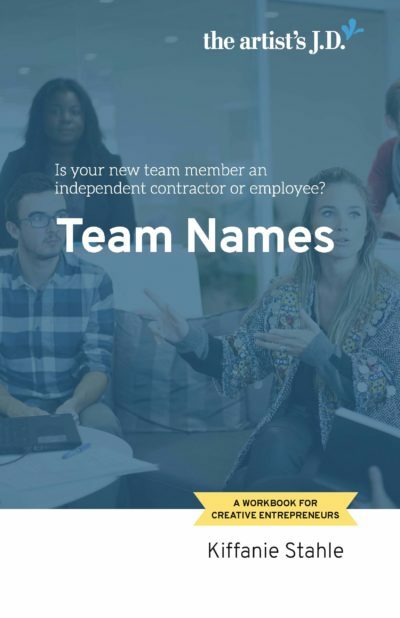 Classify your team members in the right bucket (grab the checklist below to help you do it). And then if you decide she’s is an employee, jump through the legal hoops to hire her. What tasks do you daydream about getting off your plate? What roles will your first team member fill? Let us know in the comments.